The Safariland Model 578 GLS Pro-Fit Holster with the Author’s Glock 23. At the 2015 SHOT Show Safariland introduced the GLS Pro-Fit Holster. This holster is designed by famed Safariland holster designer, Bill Rodgers, and is an amazing advancement in polymer nylon holster designs. The GLS Pro-Fit holster will likely set the standard by which all polymer holsters will be gauged in the future. Richard and I had the opportunity to attend an invitation-only media event sponsored by Safariland to get introduced to the 578 GLS Pro-Fit holster by designer Bill Rogers. 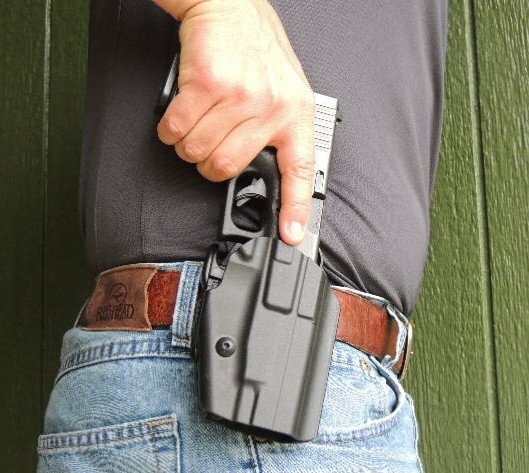 The most incredible feature of the GLS Pro-Fit holster is the ability of the user to manually adjust the holster to fit dozens of different handguns. Until now, most polymer holsters were specifically tailored to the design specifications of a particular handgun. 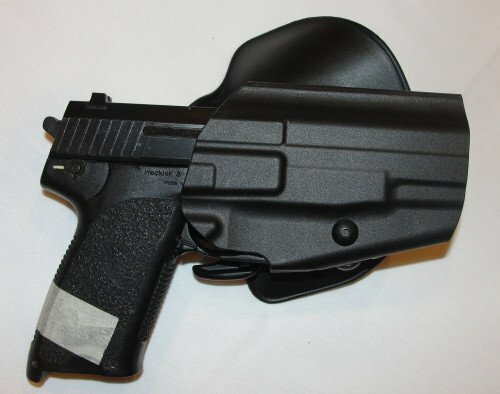 At best, a holster could fit handguns in the same line, such as the Glock 22/23/27. With the GLS Pro-Fit holster those options open up dramatically. In a project that has been over a year in the making, Safariland has developed a single holster that can be sized to fit up to 177 different handguns. In essence, the Safariland GLS holster is as close to a universal holster that is available on the market today. The GLS holsters are designed to have a tension retention feature, as well as the Safariland patented Grip Locking System (GLS). The GLS™ (Grip Lock System) is designed to fit multiple weapons in one holster, with an adjustment making the holster available to further customize fit for the officer’s preferred sidearm and cant. Adjustments are made using a Safariland wrench that is included with the holster. 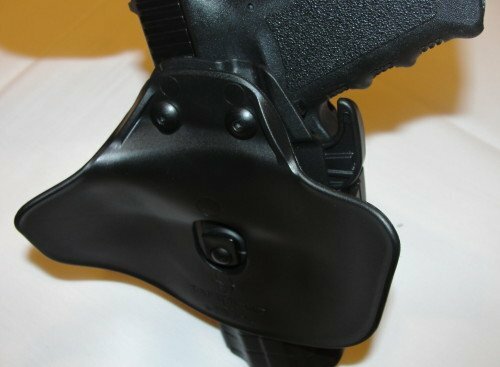 The retention screw is located on the rear of holster, underneath the GLS locking lever. The GLS locking system. 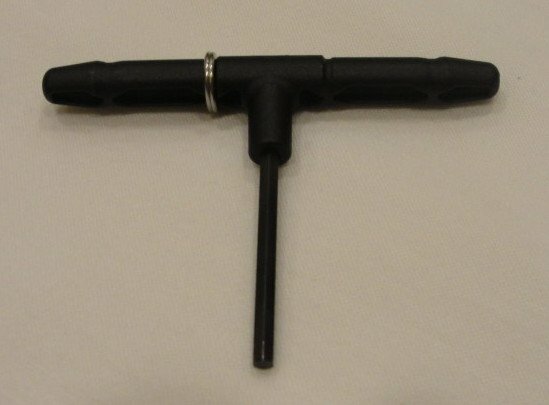 The back of the adjustment screw is seen on the left. The GLS Pro-Fit is currently offered in a Level I security design, with an open top. The Model 578 GLS™ Pro-Fit brings the unique GLS™ (Grip Lock System) and SafariSeven™ DuPont nylon together in a holster designed to fit a wide variety of handguns. The GLS holsters are secured by the use of a patented grip locking system (GLS). The GLS lever secures the trigger guard of the selected handgun. Most modern Level I holsters use a simple friction locking mechanism, where a Level II combines a friction lock with a mechanical lock. The GLS Pro-Fit inter-mixes the two concepts into a more secure Level I holster. 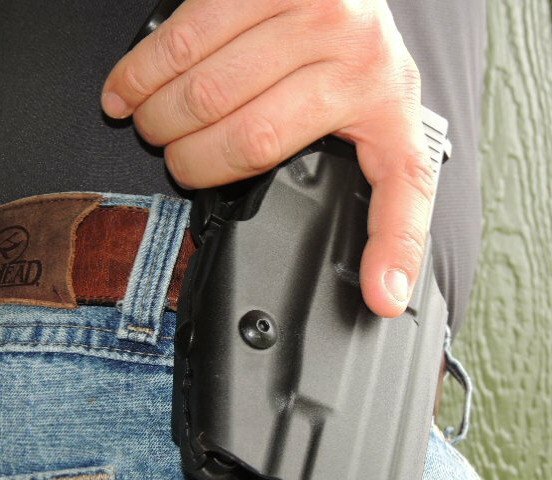 Unlike Level I holsters with a strap covering the top of the holstered pistol, the GLS maintains an obstruction free access to the firearm for more assured drawing. The GLS system is a superior safety mechanism to simple friction locks, in my opinion. 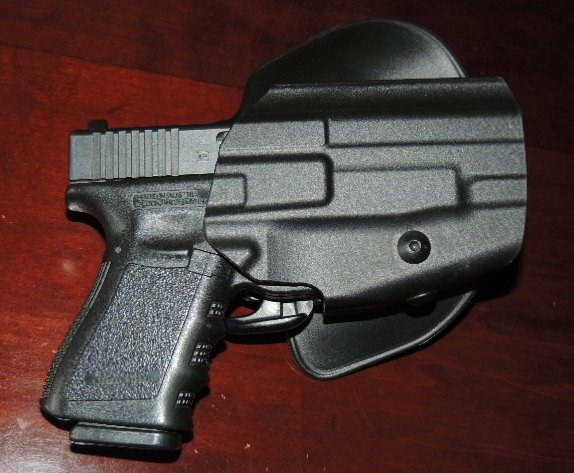 However, don’t be confused into thinking that the GLS Pro-Fit is a Level II holster. Once the GLS is disengaged, the pistol is loose in the holster, without the benefit of an added friction lock (Level II). This was specifically designed into this holster, to allow the user to adjust the holster to fit a wide variety of handguns. This is an advanced Level I holster. This video shows famed holster designer, Bill Rogers, talking about his GLS holster design. Located on the rear of the GLS Pro-Fit holsters, underneath the pistol’s handle, the GLS lever moves forward with the natural gripping motion to withdraw the pistol. This motion deactivates the GLS lock, allowing the pistol to be drawn with ease. The GLS is designed to be intuitive to the shooter’s already practiced withdraw grip, which should increase the speed and safety of withdrawing their pistol. Upon insertion of the handgun, the GLS automatically slides into place to complete the security lock. 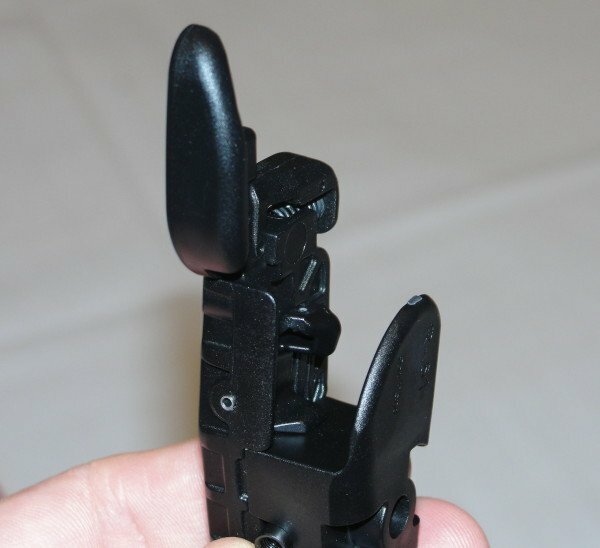 The GLS is positioned to be disengaged by the user’s middle finger upon gripping the holstered pistol. In the current design, GLS Pro-Fit holsters would be ideal for detectives, off-duty, or CCW carry, but are not recommended for duty use. However, Safariland has strongly hinted that a Level II or Level III duty holster, with the same universal features as the current GLS Pro-Fit holsters, are in the design making. That holster will have some kind of manually deactivated hood, to cover the top of the handgun like most higher level security duty holsters. Safariland uses proprietary SafariSeven nylon blend in the construction of the GLS holsters. The nylon is incredibly strong, but slim as well. The holster is designed generically enough to allow over 100 handguns from different manufacturers to fit into the same holster, ending the need to purchase a specific holster for each handgun owned. The holster body is constructed with SafariSeven™, a lightweight, state-of-the-art nylon blend that is completely non-abrasive to a gun’s finish, tolerant of extreme high and low temperatures, and easy to maintain. This holster includes an injection-molded paddle and an injection-molded belt loop that is adjustable for maximum comfort and allows the holster to be worn cross draw. The GLS Heckler & Koch pistol. The SafariSeven nylon polymer is very sturdy and mark resistant. Compatible with all Safariland® holster mounting options. Right and Left hand options. 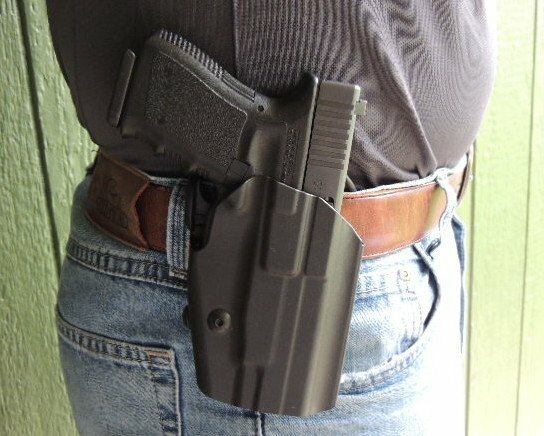 I’ve waited 5 months to do this article so I would have time to really test and evaluate the GLS Pro-Fit holster. I carried it in a variety of CCW or off-duty situations, and I’ve practiced the draw on numerous occasions. For the most part the GLS Pro-Fit delivers as advertised, and is an excellent holster. THE FIT – The Safariland GLS Pro-Fit holster comes with the option of a paddle backing or belt-loop backing. Each option is interchangeable with a pair of Allen-head screws that are easily exchanged. My personal preference is for the faster donning and doffing of the paddle backing, and I spent most of my time with that configuration. Each selection is very sturdy. The paddle design has an aggressive curve in the front, which is different from most paddle holster designs. This aggressive curve provides a more stable fit when in place, and once the officer uses the GLS Pro-Fit a few times, the fit will become comfortable and nearly indistinguishable from other paddle designs. The GLS with aggressively curved paddle backing. The belt loop attachment design is well-built and keeps the GLS holster in a steady position for drawing. The backing is longer than most belt loop holsters, providing extra stability against the body of the user. The inter-woven design for the belt provides enough friction to keep the holster in place, without a fairly significant amount of pressure to cause movement. The belt loop design felt more stiff than the paddle design, which is one of the reasons I prefer the paddle over the belt loop backing. THE DRAW – The GLS Pro-Fit takes a little while to get used to. 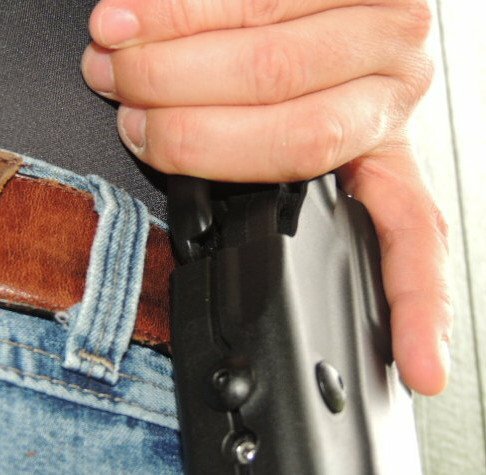 Most Level I retention holsters are simple friction locks, overcome by a strong pull upward. 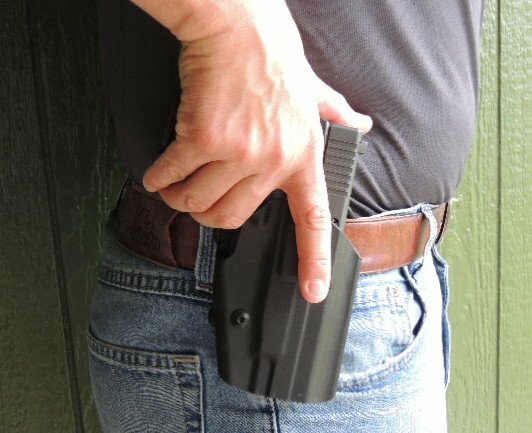 Level II security holsters typically add the second locking release mechanism with a thumb or trigger finger activation. The GLS Pro-Fit with holstered Glock 23. When I first started using the GLS Pro-Fit holster the touch of the GLS lever on my shooting hand middle finger felt awkward and out-of-place. I had to remind myself that the mechanism was in that location for a reason, and that the proper method of draw was to immediately squeeze as the proper grip was reached. Beginning the withdraw process on the GLS holster. As the shooter grips the pistol, the middle finger intuitively engages the GLS locking lever. A closer look at disengaging the GLS. Note the adjustment screw at the bottom. The shooter’s secure grip on the pistol naturally disengages the GLS locking lever. With the GLS locking lever disengaged the pistol can be withdrawn with ease. The more I practiced the easier and more natural the draw became; to the point that the mechanics of the draw became subconscious. The draw became fast and natural as designed, the awkwardness of the middle finger release began to dissipate, and did not require any unnatural movements. DURABILITY – The GLS Pro-Fit holster I tested has maintained its fit, features, and function throughout the testing process, and there are only a few minor blemishes on the exterior of the holster from my rough handling. The proprietary DuPont SafariSeven nylon polymer is not only very sturdy, but scratch and mark resistant as well. I’m confident that this holster will survive the heaviest and harshest users. ADJUSTABILITY – Safariland includes a T-handled wrench for adjusting the tension screw on the GLS Pro-Fit holster. Modifying the tension for different pistols is extremely easy. Simply place the chosen handgun into the GLS holster and tighten the screw until the pistol does not jostle at all. That’s really as easy as it is, and it can be accomplished in seconds. The included Safariland GLS wrench makes adjustments for different handguns easy. I must admit that my current selection of pistols only allowed a review of Glock 22, 23, and 27 models, but Richard has posted a separate review at GunsHolstersandGear.com where he was able to successfully carry Glock, S&W M&P, Sig Sauer, and Bersa pistols. To change from paddle to belt loop backing simply requires (2) Allen-head screws to be removed from the back side, and the new backing attached. This too can be accomplished in about a minute. The genius of the GLS Pro-Fit holsters comes from the enormous amount of firearms that can be successfully secured into the holster. The Safariland GLS Pro-Fit holsters are made with a low-cut and compact design providing easy concealment that also allows for a quick draw of the pistol. The injection-molded design combines the ability to conceal with a close to body ride, and an adjustable cant for shooter preference. The GLS Pro-Fit holsters are available in SafariSeven™ Plain Black and FDE Brown finishes. The current GLS Pro-Fit holsters are designed for double-stacked semi-auto pistols. Safariland is expecting to produce GLS Pro-Fit holsters to fit single stack pistols like the Model 1911, as a part of the newer Gen III productions around mid year. The holster I tested was a Gen II with exposed button-head screws. The Gen III have replaced those with more subdued or hidden screws. GLS 579 – Belt Clip backing for belts up to 2.25″. 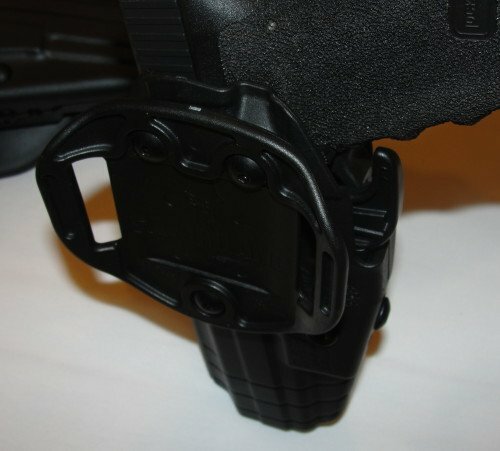 The GLS standard belt loop backing, with a Glock. The MSRP for the GLS Pro-Fit holsters is $55.00, and includes the GLS Pro-Fit holster, paddle backing, belt loop backing, and a free Model 71 Magazine Pouch (if ordered through Safariland). Bill Rogers, and Safariland have once again raised the bar for holster designs. 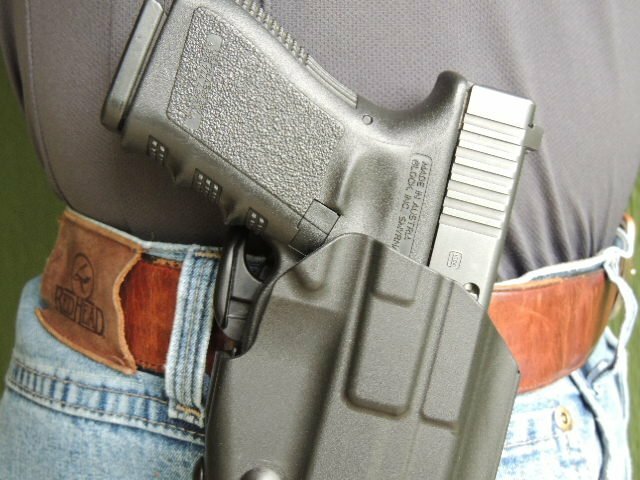 The GLS Pro-Fit holster is an outstanding CCW, off-duty holster. The ability to use the same holster for a large number of popular handguns is an incredible benefit, and the Grip Locking System is a superior advancement to traditional Level I holsters that simply use a friction retention system. 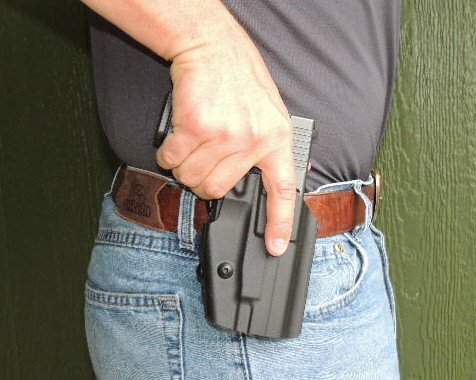 For a well-built concealed carry holster, I would recommend the Safariland GLS Pro-Fit. I’ve been running a gls for my shield for a year now. Absolute comfort and a solid lock up. Easy to holster, immediate lock and drawing is so simple its second nature. Since I always keep my forefinger on side till ready to fire, this was natural. Just got the same for my beretta 92S. Even a large pistol like this hides under a loose shirt to the point no one will notice. I’ve checked with friends who didnt know i was carrying. Really do wish this did work on my 1911. Oh well. If I can purchase a holster of this quality and KNOW it will fit first time with no hassle, I’m still going to purchase the newer style for the 1911. Folks talk about having a “drawer full of holsters”. No sense in that. At this price point, its not a problem to buy another one. Great to hear Mike, and thanks for your input. My experiences were all with full-size or compact pistols, so its very good to know the GLS still works and feels well with smaller pistols like the Shield.